We just returned from several days with friends in their family summer home overlooking Silver Lake in NH. 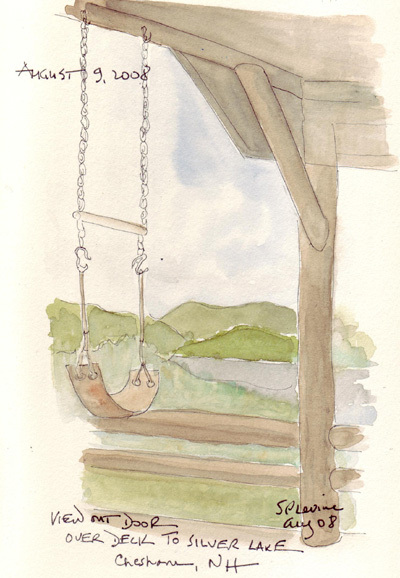 Anyone that knows my blog realizes that I paint very few landscapes, so I forced myself to upload a sketch that I did from their porch overlooking the lake. This year I'm trying to work on figures and faces, maybe next year I can work on trees in Central Park, NYC. We saw this truck parked along 79th Street in New York City when walking to nursery school last Spring. 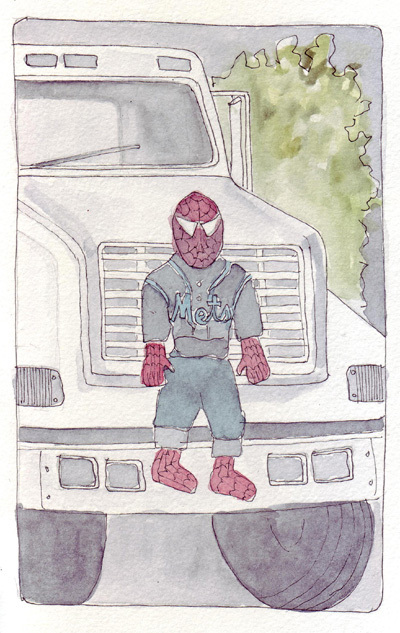 My grandson, who loves Superheroes, was fascinated by the truck mascot that was wired onto the front grill - spiderman dressed as a Mets Fan! Fortunately I had my camera with me so took a picture of him. 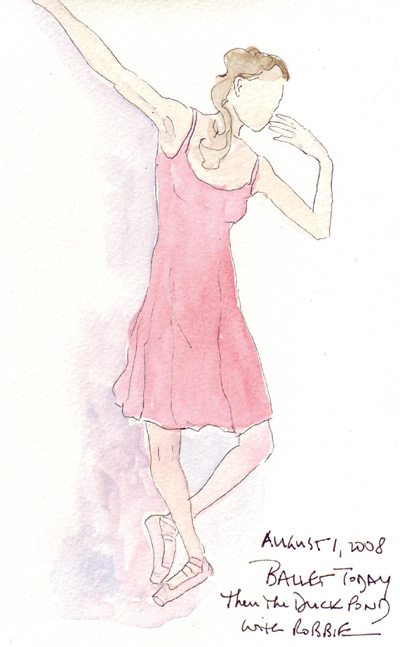 I'm still drawing figures (mostly dancers) from photos to practice sketching their body positions. 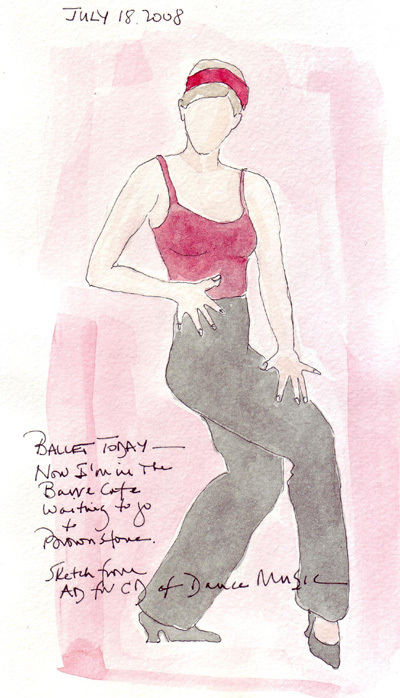 I take ballet barre once each week when I can (I hate all other forms of exercise) and then pick up a postcard advertising a dance program and sketch the photo while I have a cold drink. We pick up my grandson Robbie at nursery school at lunchtime, so I have some time to paint these while I'm still at the dance studio. 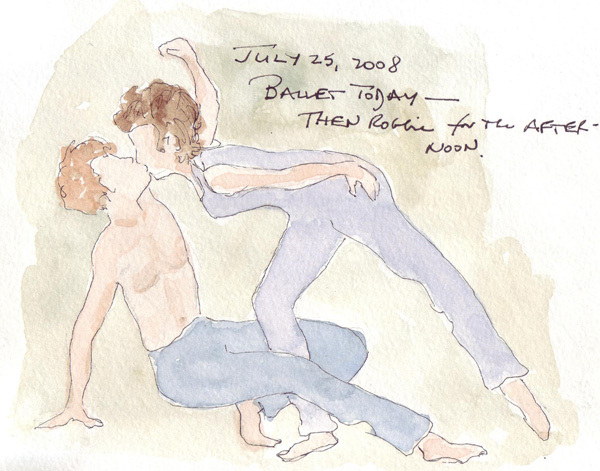 I'd love to work live, but ballet dancers are in constant motion. I've made no progress on adding faces so far this year and their hands are still pretty awful, but I know that constant practice is important. Here are some of the ones that I sketched in July. 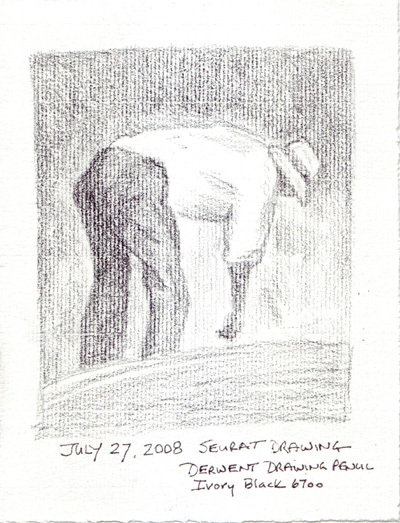 I also copied several more Seurat drawings onto the modern equivalent of the paper he used and here is the last one I did. I usually don't draw only in pencil, so using his drawings as inspiration and experimenting with the Arches MBM 105 grain paper and some of my pencils is fun. EDM Challenge #180: I had a really difficult time with Challenge #180 - Draw Something in Your Favorite Color. I did a Color Project after being inspired by Laura several years ago and you can see both of our many entries by going to the category list on our blogs. How could I possible select one color when I love them all and don't consider any drawing done until I add watercolor washes. Then one evening my son sent me a photograph of my newest grandchild Annabelle's delicious pink feet. 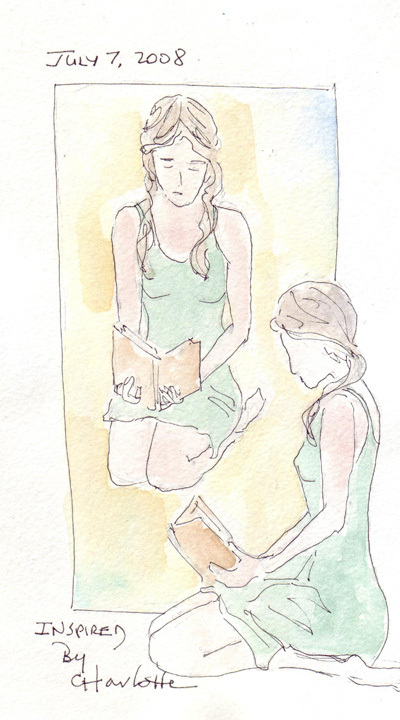 It was then that I decided that I had to sketch and paint them for this challenge in honor of both of my grand daughters. Sydney lives in a pink room with pink comforters and quilts and for years seemed to only want to wear pink clothes. 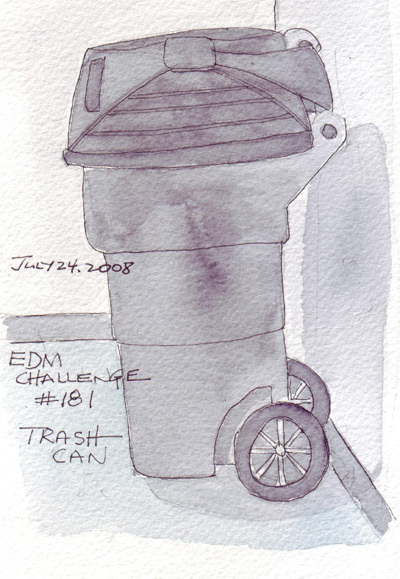 EDM Challenge #181 Draw a Trash Can: I couldn't find any interesting trash cans to draw until I walked around a corner in my office building and saw this behemoth - in a hallway where some room renovation was being done. I wish the colors were more interesting! 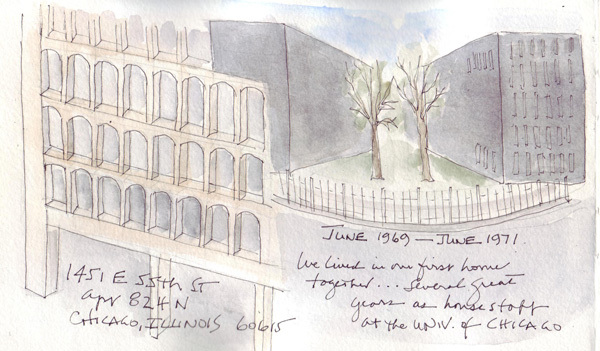 My husband and I were married midway through medical school, but lived in Philadelphia and Chicago until we graduated. Then I joined him for post-grad training at the University of Chicago and we moved into our very first "adult" apartment together. 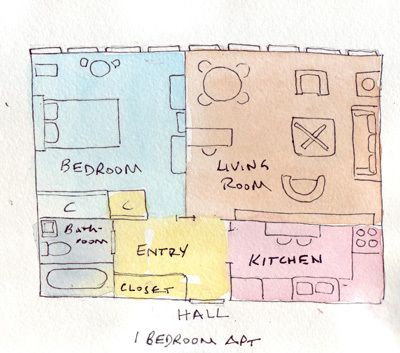 It was a lovely modern apartment in one of two buildings that sat on a landscaped island in the middle of E 55th Street. Friends used to call it carbon monoxide island because the two lanes of traffic on E55th Street separated to go around the apartment complex. I have only a few photos from our years there - one taken during a snowstorm when the buildings were silhouettes and the other taken of just one corner of the building showing the architecture. I'm not pleased with my page composition, but know how I will position these images when I work more on this series.